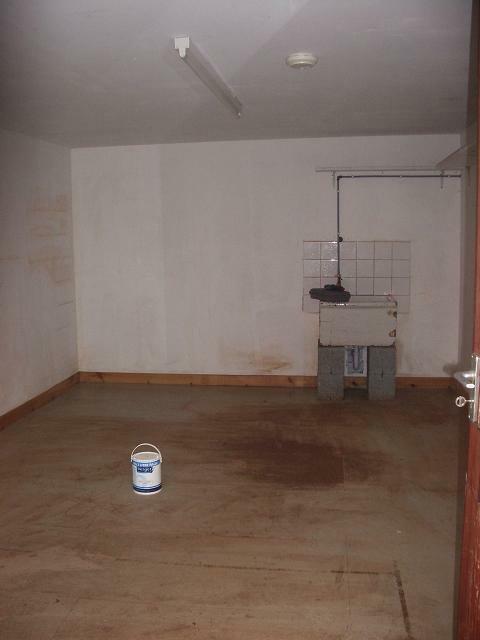 This morning – big clean empty space, all neat and waiting to be filled. Sink still needs plumbing in I know. Comfy chair and log fire though is a good start. Chair not so comfy as to easily be able to fall asleep on it without ending up on the floor very quickly – cunning plan I think. 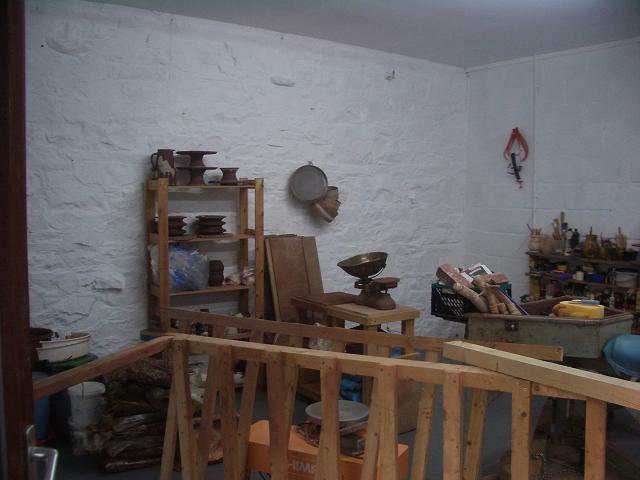 This evening old workshop all empty and swept and mopped and the walls wiped clean as best as one can of the mucky red stuff. I try to be quite tidy and clean in there but I was stunned at how much dust was left when I emptied it and at how large it feels when it is empty. Now the big empty space is full of my stuff and I’m wondering how on earth this lot over fitted into my old space. I know it’s not at all organised, I just had to get it out of the old one and in in any shape or form as the new inhabitant moves in on Monday. I don’t think I’ll be making pots for a while though, too much chaos. I’m very excited, it’s great to be moving on but where on earth to start to make any head way on that! Huge thanks to Hazel and Alan for painting away like crazy demons on Wednesday and to Alan for helping me get my kick wheel out of the old place – now do you believe me that the door has to come off it’s hinges before the wheel will come in or out? This evening was an event in the village here for artists and craftspeople from across our region. I had been asked to speak at it and after much umming and ahhing I’d agreed but have been worried sick about it for a number of weeks now. Thankfully today I had to concentrate only on shifting stuff else I’d have been in a big old mess all day. I was to speak about my kiln building project. In the original blurb about the event it said you could have 6 images and I thought I was pushing it with the 10 pictures I’d picked of the kiln in various stages and a couple at the end of electric fired pots and wood fired pots to show the difference. It had to be a powerpoint thing which I am not very familiar with and the projector didn’t really show the pictures as they were, they were a bit dark so you couldn’t always tell what the kiln ones were showing and then the difference between the electric and the wood fired things didn’t show up too well either. I’d taken actual pots but was too chicken to get them out. So I had my 10 pics in a line of pictures only to feel rubbish after I saw the beautiful clever presentations of the other two speakers, Amanda Simmons with her incredible work, it really is something else and the way her mind works is fascinating and Ian Cant who uses right up to the minute technology to create sculptures from clever things that I hadn’t the faintest understanding of but was very impressive. They both spoke eloquently and fairly logically and it was understandable. I thought after having got it over and done with and out of the way that tonight I would sleep like a log especially after the physical exertions of the day – but no here I am at half past midnight wide awake and beating myself up for having forgotten half of the things I had wanted to tell people. I had notes on cards to go with the images but I couldn’t concentrate because I felt I was just garbling and urrrring and that made me panic even more. In the end if anyone made any sense out of it I’ll be amazed. I made what is a very exciting project sound like something stupid and dull and the fact that it had taken me so long (even though my notes told me to talk about the having to fit it in between actually doing all the other things that need doing to make a living and having been not brick lifting fit for a good few months etc etc) just made me sound like I’d been lazy and not really trying. I know I’m probably being over harsh on myself but I am kicking myself for not doing better but I’m frustrated and annoyed at myself. I don’t know whether it was harder knowing that I knew a lot of the people in the room or not. I really need to practise talking more though if I’ve any chance of making Kindrogan and the “American tour” go any better than I felt this did. Just to top it all I had some more neck pulling treatment tonight which is great and will feel better in the morning but that and the moving stuff stuff and more stuff of today leaves me shattered and sore and annoyed with myself. Ho hum. It’s the weekend at least so hopefully I’ll get a lie in in the morning unless that huge beautiful moon has me awake at 5am again shining so brightly and managing to beat even our thick curtains and kid me that it’s morning and daylight and time to wake up. This entry was posted in new workshop, old workshop. Bookmark the permalink. Oh H it looks fantastic and oooh that fire :)) lurvely….don't stress about the talk it's all good practise…or the tech stuff get someone else to do it for ya 😛 exciting stuff!!!!! Congrats on the new space! Exciting. In no time it will be "the old space" and feel like home and have lots of its own memories. I'd do a special piece to celebrate the new place and put it on display. Keep us posted on how it goes! 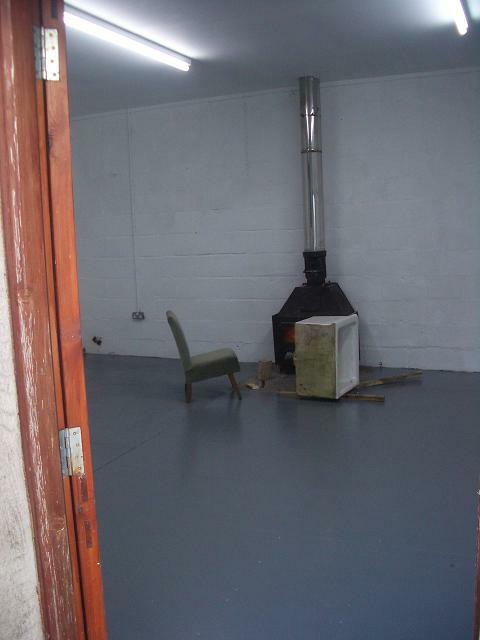 What a great space – and lucky you having a wood-burning stove, I had one in Scotland and could really do with one here in France right now! I hope you enjoy settling in and finding the right place for everything – when I moved workshop I found all sorts of tools etc I thought I had lost – I expect you'll be finding all sorts of old friends too, although your old workshop looked very tidy and organised.I'm sure your talk sounded good, to the audience, Don't compare your talk with everyone else's – it's you they want to hear, not a stereotype presentation! I'm really looking forward to seeing you at Kindrogan. 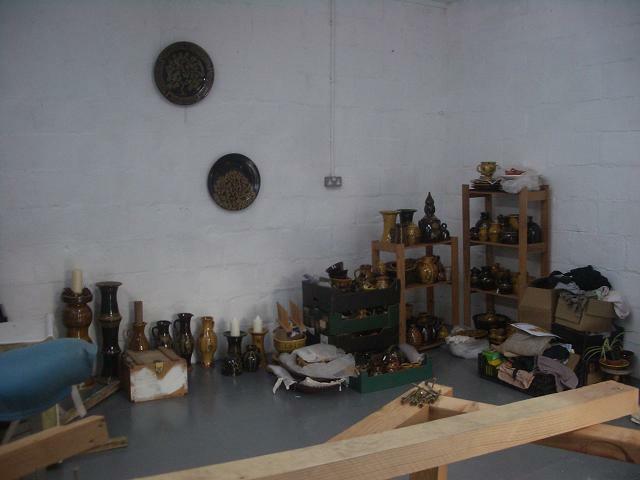 The talk was good practice-look at the first and later vids on your blog….and next time, take pots with you too. After all pots are made to be touched and handled…Enjoy the new workspace! a new space means lots of new possibilities!But I want a Hannah paper doll like ANG made- might have to have one! Hannah – a quick question – is your Shimpo wheel (that I can just see in the photo)the smaller Whisper T which is less powerful that their top model? If so have you ever found it not powerful enough for larger pieces? I have that one and it's brilliant (but then I only make smaller pieces) but the other potter who teaches with me doesn't think it would be powerful enough for our class. Any comment? sorry, I know you're rushed off your feet, but I don't know who else to ask! Hannah, I thought we were keeping our visit to the 'Big Apple' a secret from Doug so that we didn't scare him off?!? !Just kidding, but I definitely plan on stopping there as we head down south from the Cape!